The State Controller's Office (SCO) mails the employee's 2018 Form W-2 Wage and Tax Statement no later than January 31, 2019 via the U.S. Postal Service. This includes wages paid in 2018 (December 2017 - November 2018 pay periods). The SCO mails your W-2 to your home address on file as of December 14, 2018. The October 2018 pay period pay stub listed your home address for verification. 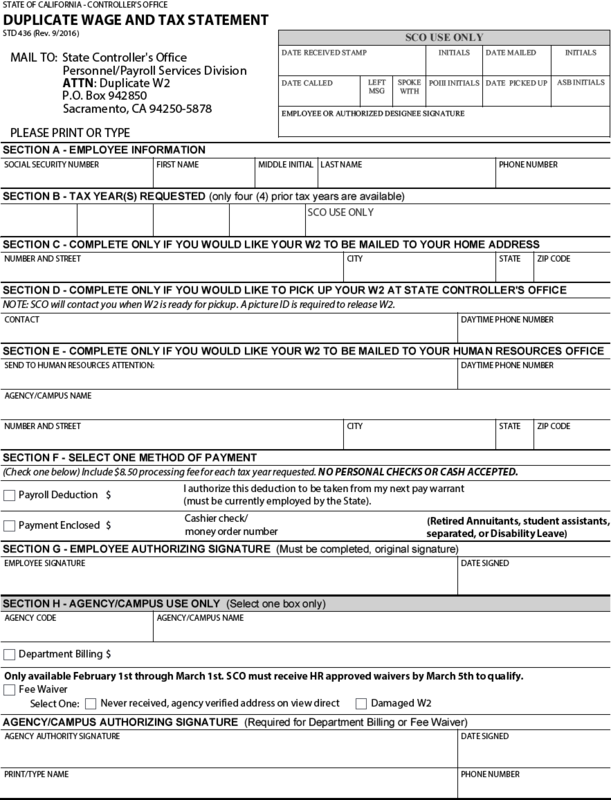 If your W-2 form is undeliverable, the U.S. Postal Service will return the W-2 Statement to the Human Resources office in ADM 252. Human Resources will attempt to notify employees within two (2) weeks of returned W-2’s. If you did not receive your W-2 Statement and it was not returned to Human Resources, you will need to file a duplicate W-2 request. You may also visit Request a Duplicate Form W-2 link. Note: If the SCO sent your W-2 Statement to the address on file as of December 14, 2018 and you did not receive the W-2 Statement, you may apply for a fee exception. To receive the exception, you must report the lost W-2 to the Human Resources Office by Tuesday, February 26, 2019. You may request more than one W-2 tax year; however, only four prior tax years are available and the $8.50 processing fee applies for each tax year requested. For current active salaried employees, payment for the duplicate Form W-2 may be paid via payroll deduction by checking the appropriate option on Form 436. Once you submit Form 436, the SCO will deduct the fee from your next paycheck.